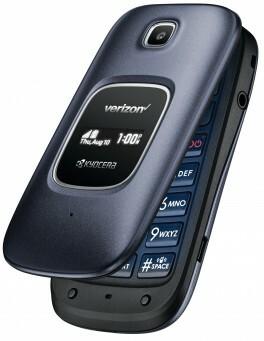 Kyocera this week announced the Cadence, a flip phone for Verizon Wireless that supports LTE but not CDMA. In addition to LTE, the Cadence sports WiFi with voice over WiFi and HD Voice for clearer phone calls. The main display measures 2.4 inches with QVGA resolution, while the external monochrome display measures 0.9 inches with 128 by 36 pixels. The handset runs Kyocera's proprietary non-touch user interface and is powered by a 1.1 GHz Qualcomm Snapdragon processor with 2 GB of memory and 16 GB of storage. It includes a fixed-focus 2-megapixel camera and a removable 1,430mAh battery. Other features include a headphone jack, Bluetooth, GPS, voice recognition, and WiFi hotspot for up to 10 devices. The Kyocera Cadence is available from Verizon Wireless for $120.